In 1959 Charles Daniels discovered the skeletal remains of an Anglo-Saxon inhumation burial whilst undertaking excavations in preparation for a new school that was to be built on Church Street, Southwell, Nottinghamshire. This burial is one of close to two hundred and fifty that have since been unearthed at the Church Street site, but it is also unique. For what Daniels discovered was a deviant burial or, to paraphrase Dr. John Blair, one of the ‘dangerous dead’ (Blair, 2009), because the remains had been ritually staked, with iron nails piercing the shoulders, heart and ankles (Daniels, 1965), a practice that although so far unique to Southwell, is widespread in the early Anglo-Saxon period. Ever since Major Hayman Rooke found evidence of the Roman villa in and around the Church Street site in 1787, the Saxon remains have played second fiddle. In his 1959 excavations, Daniels gained evidence relating to the bath-house of the villa in the East Wing, and of several rooms complete with mosaic floors in the South Wing. And more recent excavations at the proposed development site on Church Street by Pre-Construct Archaeological Services Ltd. (2008-09) revealed further structural remains and sections of a large stone wall probably dating to the 2nd century AD. Yet what these excavations also revealed were some of the jigsaw pieces relating to the early Saxon church and cemetery site at Southwell, a church whose whereabouts remain elusive, at least for the present. When Daniels excavated part of the South Wing of the Roman villa (his Trench 6) he discovered the remains of later Saxon burials, of which he found thirty in the areas of rooms one and six of the villa. 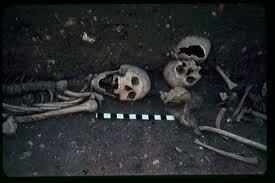 These were intact Christian burials (aligned east-west) or remains that had been disturbed by later ones. Trench 2, which was further to the east and close to the current development site, revealed an altogether different picture. Here two thin, diagonal trenches had been dug that cut across Roman features, and into these the disarticulated remains of several individuals had been deposited (Daniels claims at least a dozen), with one exception. This was the deviant burial, which had been buried (or reburied) intact along with a further leg and lower arm bone (Daniels, 1965). Daniels (1965, 25) believed that in Trench 2 he was ‘outside the limits of the churchyard, and dealing with something other than normal Christian internment. Without speculating wildly on the implications of the iron studs, it is known that treatment of this sort was accorded to bodies which had died unnaturally or when there was some reason to fear the supernatural’.